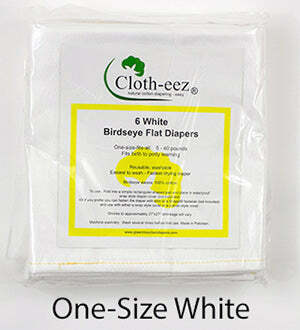 Cloth-eez® Birdseye flat diapers are chlorine-free, optical brightener-free white cotton Oeko-Tex certified old fashioned flats. Save 15% with coupon BESTFLATS15 through Earth Day, April 22. EXTENDED through April 23. We also have organic in stock. Sold in packages of six diapers. Also available individually so you can try just one first. Save when purchasing in packages of 6 diapers. Size Half in White purple edge stitch, for preemies or small newborns 4-8 pounds as a diaper, or to potty learning as a doubler for extra absorbency, approximate size 16 x 27 inches after washing. Size One-Size in White yellow edge stitch 6-35+ pounds. 28x29 before washing and shrinks to around 27x27 inches. Classic flats. Quality fabric. 100% cotton birdseye diapers. "One-Size" fits birth to potty learning, or is a one-size fits all size. Our "one-size" size is not very small at all! In fact, our "one-size" is larger than some other brands size large. Size Half works for preemies or tiny newborn babies. Add the Size Half birdseye to the one-size flat when you need more absorbency without the bulk of double diapering. But if you need a lot of absorbency, doubler diaper. Double diapering is using two flats at once. See the videos to learn how to fold flat diapers and see this on a baby. FREE pair of pins is available with purchase of this item but you must add the pins to the cart in order to receive them. Free pins link. I loved how these diapers are finished! The raw edges are actually turned under and hemmed for a professional finish unlike the ones I saw in the stores that are only serged. These were a gift for my son and daughter-in-law. I absolutely love the Cloth-eez flats. I have one size and half size .I pin these, pad fold in a cover, pad fold in a pocket. Use them as day and night diapers with a half flat for extra absorbency. They wash and dry like a dream. I don’t have stink or stain issues. If I could build my diaper stash again I would have skipped everything we bought and went with flats and covers/pockets. Great! Easy to clean, not bulky because of the selvedge edge, very absorbent. Hate that I wasted any money on those terrible gerber flats. I started using cloth diapers 6 years ago and I wish I had known about flats back then. I wasted so much time and money on stinky microfiber and pocket diapers. By my 3rd child I had switched to prefolds and covers, which are great, but somehow my 4th child at 5 months old was in between sizes of prefolds I had. Instead of buying a new set of prefolds I decided to try flats. I am so glad I did. They are versatile, easy to fold, wash well, and dry quickly. I would recommend them to anyone. I love our Birdseye flats and would continue to recommend them to anyone that is wanting to switch up their system. I was using target FSTs and my son would out pee them in an hour at 8 weeks. These flats are incredibly absorbant and very trim with a modified origami fold with good key wings.